You know that feeling of satisfaction when finding external support for a personal belief? That’s what I was looking for with this quirk. After reading a lot about healthy diets in scientific studies and research papers, I didn’t believe The Right Cup fits here. Initially I was convinced that the only 100% healthy way to ditch a bad habit is going cold turkey, because otherwise the brain will go into placebo effect. I’m still not fully convinced that replacing sugar with sweeteners is just as good for the body as skipping sugary experiences altogether. Nevertheless I didn’t find any compelling evidence to back this up, so for now I’ll just play neutral about it. This cup, unlike this one, is made to smell and taste, which creates the impression of drinking flavored water. It promotes a healthier lifestyle by making people drink more plain water and less sugary drinks. A lot of people dread drinking water because it has no taste, so most refer to drinking water as unsatisfying. 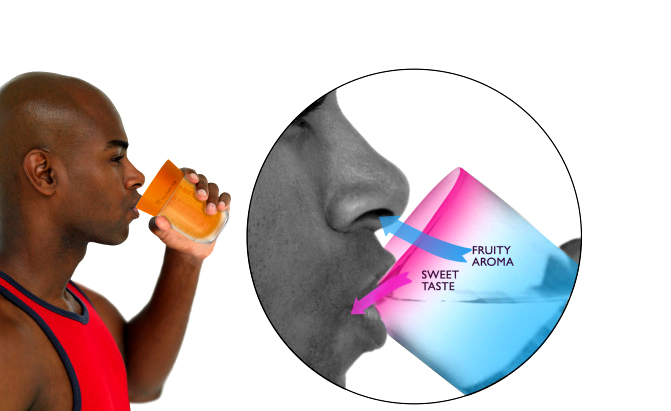 The idea behind The Right Cup came from the fact that 80% of the taste experience comes not from taste buds, but from smell. And that’s indeed true considering when we have a stuffy nose we normally can’t taste much of what we eat.